Yes, We CAN learn about Robotics! With the LEGO WeDo Robotics System, young children can build and program their own robotic creations. Designed by the experts at MIT, this unique system teaches children about simple machines, engineering, programming and so much more. Young imaginations soar! 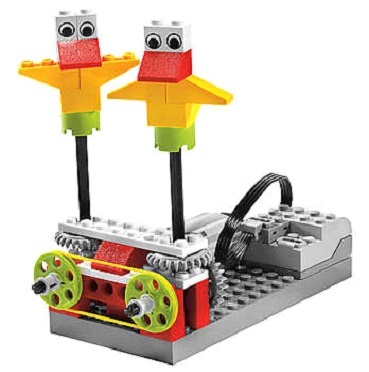 The LEGO Education WeDo Robotics Builder allows students to explore different Robotic Themes. Possible models may include: Dancing Birds, Hungry Alligator Robot, Goal Kicker Robot, Rescue Plane, and a Smart Spinner Robot. Students working in teams will work with simple machines, program models they design and create, measure time and distance, write, and much more! Your students will build LEGO models featuring working motors, tilt sensors, motion detectors, and Lego USB Robotics Hub.